“Ms Wake, who has died in London just before her 99th birthday, was a New Zealander brought up in Australia. She became a nurse, a journalist who interviewed Adolf Hitler, a wealthy French socialite, a British agent and a French resistance leader. She led 7,000 guerrilla fighters in battles against the Nazis in the northern Auvergne, just before the D-Day landings in 1944. On one occasion, she strangled an SS sentry with her bare hands. On another, she cycled 500 miles to replace lost codes. 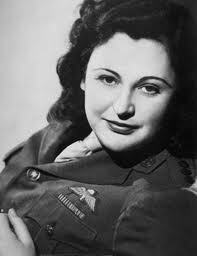 In June 1944, she led her fighters in an attack on the Gestapo headquarters at Montlucon in central France.